Copy and paste these sketch examples into your Arduino IDE and begin to experiment with MakerPlot. 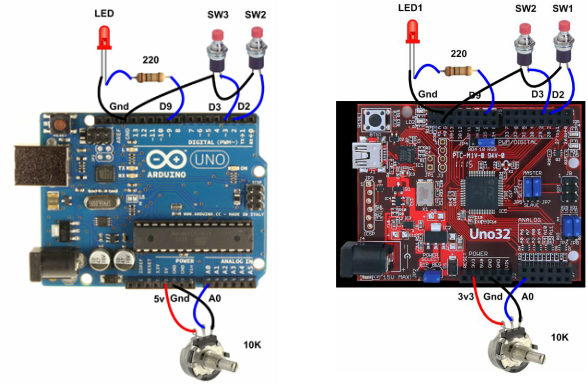 You will need an Arduino UNO or similar microcontroller hardware setup like the chipKIT Uno32 shown beside it along with a 10K potentiometer, two push button switches and an LED for full implementation of these sketches. Note that the potentiometer "red" lead connects to +5v on the Arduino UNO and +3.3v on the chipKIT Uno32. All other connections for the external components are the same for both setups.